Sun Records (2017) : Série TV de 1 saisons et 8 épisodes diffusée sur CMT. Casting, acteurs, bandes annonces et actualités. 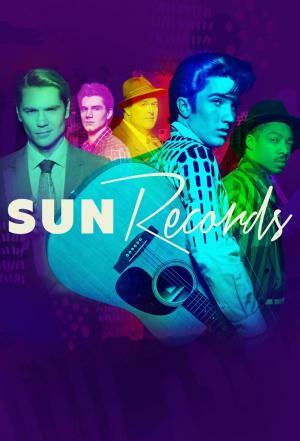 Casting de la série "Sun Records"
S01E01 706 Union 23/02/2017 Sam Phillips moves his family to Memphis to open a recording studio to look for his first hit musical act, but instead rekindles a steamy affair. Young Elvis Presley and Johnny Cash struggle at home. S01E02 Outta The Groove 02/03/2017 Sam records B.B. King, but his new label struggles. Elvis is inspired by African-American music, but is chastised by his family and girlfriend for crossing racial lines. We meet cousins Jerry Lee Lewis and Jimmy Swaggart. S01E03 Record Man Blues 09/03/2017 Sam can’t find the follow-up hit to Ike Turner’s “Rocket 88.” Colonel Tom Parker’s conniving ways are exposed. Jerry Lee Lewis and Jimmy Swaggart have their eye on the same girl. S01E04 Never Better 16/03/2017 Sam's worsening anxiety attacks lead to a radical new medical procedure; Elvis tries to win Trixie back; Johnny Cash, who is overseas, makes a decision that affects his girlfriend back home. S01E05 Rising Sun 23/03/2017 Sam finds another hit with Johnny Bragg and the Prisonaires; Becky makes a surprising announcement; Elvis enlists Sam to help him record a song for his mother; Johnny takes his relationship with Vivian to the next phase. S01E07 No Favors Here 06/04/2017 Elvis gets his first taste of fame when he starts playing live shows; Colonel Tom Parker scams his way out of debt and eyes an opportunity with Elvis; Johnny returns from overseas to begin his life with Vivian. S01E08 Finishing School 13/04/2017 Colonel Tom Parker presses to take over Elvis' career, but Sam struggles with the decision to let his star go. Meanwhile, Jerry Lee's philandering catches up with him; and Johnny starts his own band. Envie de parler de Sun Records ? Les discussions sont là pour vous. Retrouvez toutes les informations sur Sun Records lancée en 2017 : synopsys, casting complet, acteurs, scénariste, réalisateur. Découvrez des séries similaires à regarder également. Faites vous une idée de la série grâce à la note des membres et aux critiques des internautes.